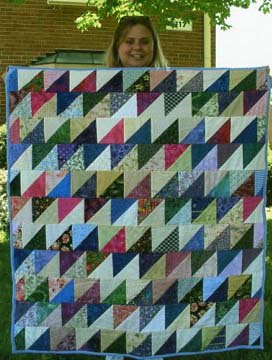 Laura says this quilt started with her scraps! Laura Wasilowski is a multi-talented lady. 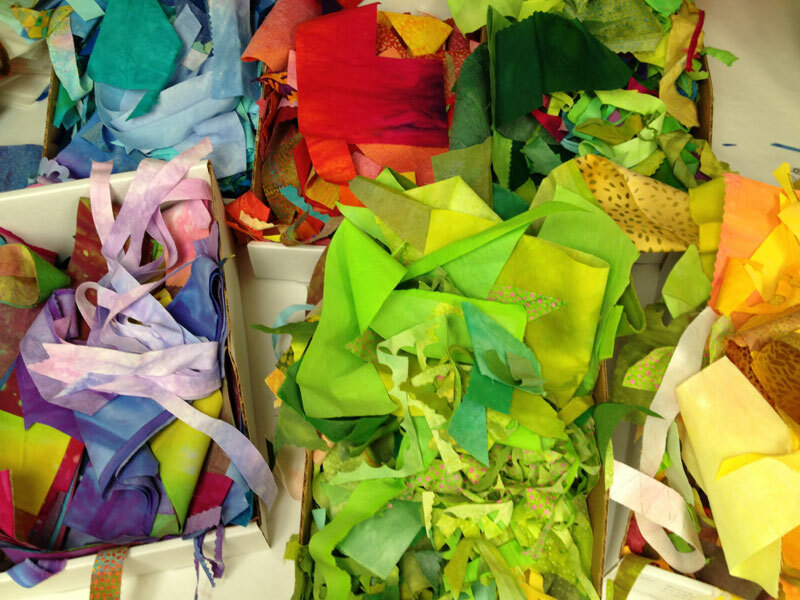 She makes bright, fun art quilts from fabrics she dyes herself. She even dyes her own embroidery floss! 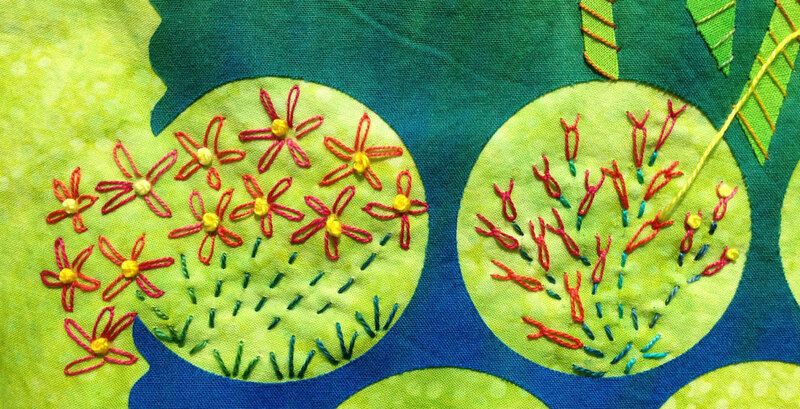 Her classes are well organized with many useful hints to make fused quilts in a variety of ways. She even sings–yes, well enough to sing in public without embarrassing herself! …… I spent 3 enjoyable days taking classes with her at Quiltfest (see the post for August 11), but she has a Craftsy Class, too. One of the things she said that I liked best is that her scraps are the start of her next quilt! She even saves tiny scraps. This works especially well because she has fusible glue on the back of all the fabric she works with, so those tiny scraps are ready to place and fuse wherever–no worries about seam allowance! I enjoy her creations because they are bright and cheerful. I hadn’t done any embroidery in YEARS until I took her classes, but I enjoyed adding both embroidery and beads to the things I made in class. Laura does beautiful embroidery with her own hand-dyed threads, as shown in the picture below of a work in progress. There’s also a larger picture of the entire work so far at the bottom of the post. You can learn (a lot) more by checking out her website here. Some of Laura’s embroidery–it’s tiny! 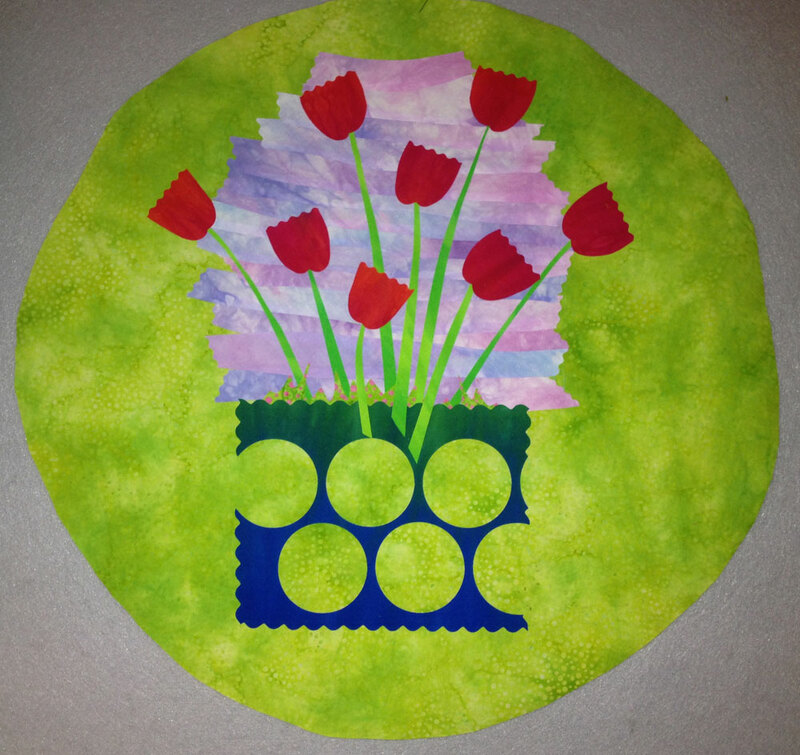 I recommend Laura’s classes–so much fun, and a new creative outlet! She has a book and DVDs, too, but part of the fun of her class is her sense of humor. Lots of fun. My plan here is to make modern quilts to clear out ALL my stash, and yours! With that in mind, here are some fun quilts to make if you have lots of charms (5 inch squares), or squares of any uniform size. Just sort the squares into lights and darks and make half square triangle blocks using your favorite method (or here are half-square triangle instructions on another website). Just offset every other row a half block so that the points on the Row 2 blocks fall at the center of the Row 1 blocks–look at the picture on the left and you’ll get the idea! THREE: You can even arrange your blocks to make really big zigzags across the quilt: This is the most challenging of the bunch in terms of making the corners match, but of course the design also has a big impact because of the big chevrons. 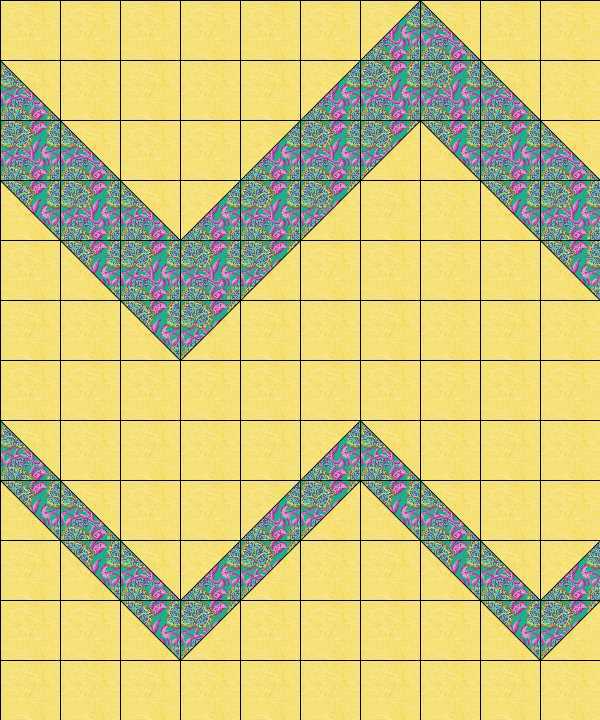 A bigger chevron would obviously be easier if you started with larger squares. Got any layer cakes (i.e., packages of 10 inch squares) you’re wondering what to do with? As you can see, this example shows two different ways to make BIG chevrons. I’ve made a couple of zigzag quilts, one scrappy and one using all my purple charms. It’s a fun way to make a quilt with a lot of graphic appeal while using stash. Now, let’s go make some chevrons! I recently went (again) to Quiltfest, in Jonesborough, Tennessee, for 3 wonderful days of quilt classes and relaxation. 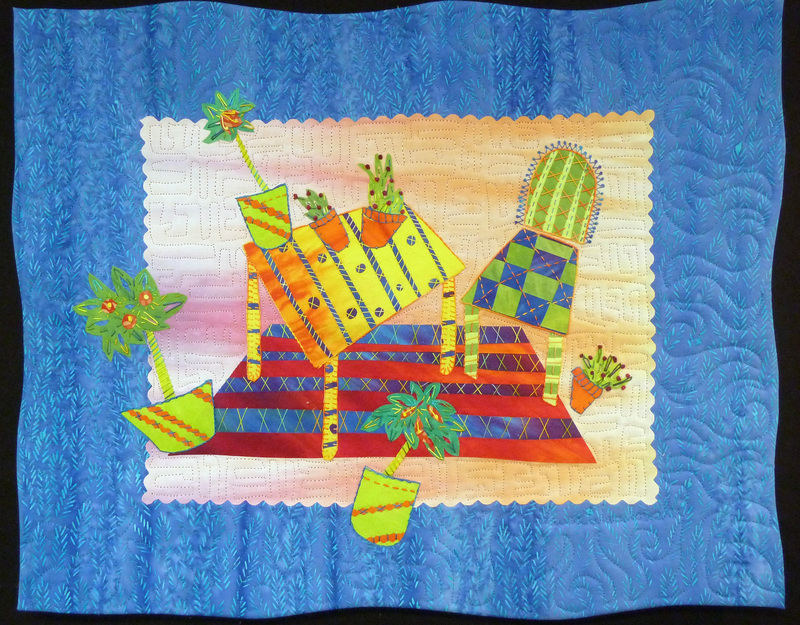 This annual July event, put on by Tennessee Quilts, is always lively and fun. In addition to classes, there are lectures, and a dinner with lots of door prizes. Laura (right) hand dyes her fabric and even her embroidery thread! This year’s teachers included Laura Wasilowski, Sue Jones, and Sue Nickels, among others. 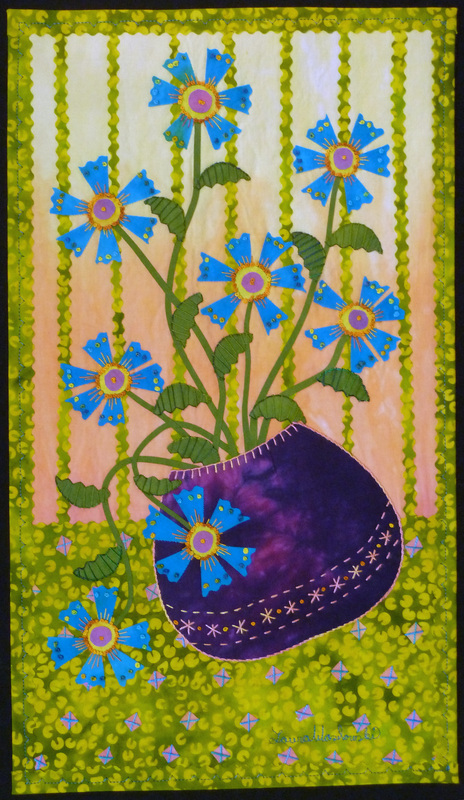 I loved ALL the classes offered, but chose to spend three fun days with Laura Wasilowski making fused art quilts. You can still see the brochure advertising the event here to get an idea of all the offerings. In addition to the classes, lectures, and social events, the shop had 20% off everything! This is a great shop and was featured in Quilt Sampler magazine as a Top 10 Shop in 2011. Therefore, you KNOW I had to have a FEW things while it was all 20% off 😉 They even gave the discount on fabrics from their large sale section! Woo-hoo! Laura Wasilowski has agreed to an interview, so I’ll be featuring her and her work in a future post. Meanwhile, you can get information on Quiltfest 2014 by keeping an eye on the Tennessee Quilts website. I DO have a plan, though. These lovelies will be made into the Bermuda Sunrise pattern that I’ve been meaning to make for some time. If you’re not familiar with the pattern, you can see it here. 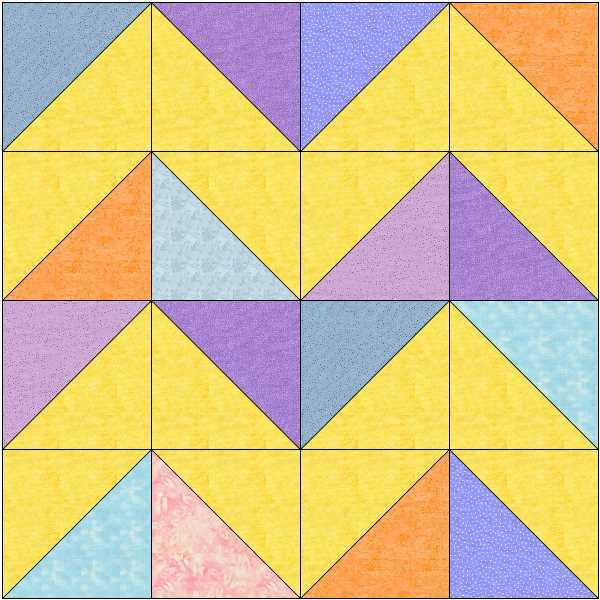 Modern Quilts Unlimited magazine just ran a modern quilt block contest, so of course I made a few blocks. Well, OK, I made several and then picked 3 to submit. Here are some of those that didn’t make the cut for various reasons. I’ll note the reasons as captions on each one just for the heck of it. I thought probably everybody in America would do a variation on the 9-patch. However, I noted that, when oriented with the biggest part at the bottom, the block appears 3-dimensional, so I’ll tuck that thought away for another project. Along those same lines, I really, really like adding tiny strips into things (using Judy Niemeyer’s method), so I made a tic-tac-toe block. I like the fact that the print has crossed lines and my insets are crossed lines too, but overall the block didn’t really work for me. Next, I took an improvisational block I made in a class with Heather Jones (who is an excellent teacher, by the way). I cut it to size (12.5 inches square per contest rules) and made the angle wonkier while I was at it. I liked this a lot better. If only I’d used my tiny lines to make the grid it might be perfect. I love stars, so my next attempt was an eccentric star using the flip and sew method for the points. I really like this one, and I like the fabrics, but it lost out to one I liked better. I can’t show you the 3 blocks I finally selected to send in to the contest, because they can’t be published prior to the contest. However, I promise you’ll see them later whether I win or not. Now I need to make a quilt to use all these also-ran blocks!